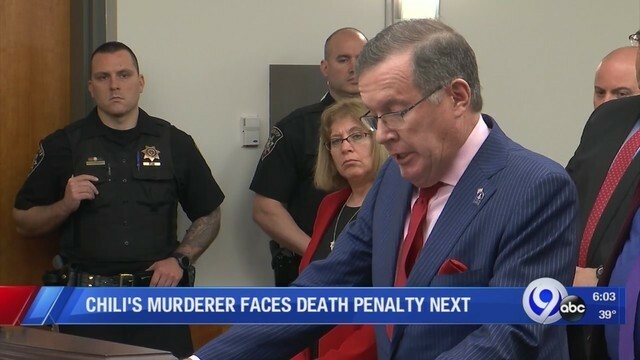 SYRACUSE, N.Y. (WSYR) - William Wood Jr. was sentenced to life in prison Monday morning in Onondaga County Court, but the families of Kristopher Hicks and Stephen Gudknect want more justice for their loved ones and are pushing for Wood to receive the death penalty. Speaking in court, Kristopher Gudknect's mother, Nancy Chappell and Kristopher Hicks' father, Kevin Hicks addressed both the local court and federal prosecutors. On Friday, United States Attorney General William Barr authorized the U.S. Attorney's Office in Syracuse to pursue the death penalty, because Wood's robbery turned homicide, involved a restaurant with chains across the country but that doesn't guarantee it. "This isn't a bar fight, this isn't a drug deal gone bad, this is I'm going to four people that I know. I know they have kids, parents, spouses, i'm going to kill them because it makes my life easier. i can get the cash and i can get away," said Onondaga County District Attorney Bill Fitzpatrick. To hear more from the victims' families click the link above.